BMW Team RLL Qualifies Seventh and Eighth for the BUBBA burger Sports Car Grand Prix at Long Beach; DePhillippi P7, Krohn P8. BMW’s Ultimate Driving Experience Returns. Woodcliff Lake, N.J. – Apr. 14, 2018… A fifth place finish by the No. 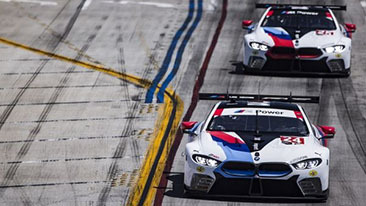 24 BMW M8 GTE of John Edwards and Jesse Krohn in today’s IMSA WeatherTech SportsCar Championship BUBBA burger Sports Car Grand Prix at Long Beach made a difficult day much better for BMW Team RLL. What started as an excellent race for the No. 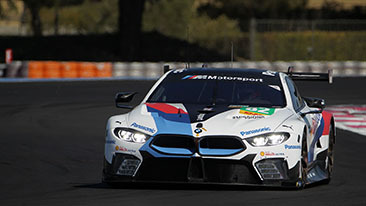 25 BMW M8 GTE of Alexander Sims and Connor DePhillippi, after clever pit strategy and the luck of a caution period, ultimately saw the car retire from the race on lap 37 after leading for nine laps. DePhillippi started the No. 25 M8 GTE from the seventh GTLM class position and was the first car in class to pit on lap 17 at the 29 minute mark as the fuel window opened. Sims took over the controls and reentered the race with new Michelin tires and enough fuel to make the end of the race. A broken prototype brought out the race’s second yellow flag minutes later allowing Sims to save fuel and cycle to the front of the class as the balance of the field made their stops. Krohn, who had started the race in the eighth position, held position in the No. 24 M8 GTE. After leading nine laps, Sims was hip-checked back to second place at the fountain complex by the No. 912 Porsche. Edwards, now behind the wheel of the No. 24 M8 GTE from lap 23, raced in the seventh position. The complexion of the race for BMW changed on lap 36 when Sims tagged the wall exiting the turn 10 hairpin and was forced to the pits. Ultimately, the car was retired. Lap 40 saw Edwards take over the sixth position. 11 more laps saw the No. 24 M8 move up to fifth as the No. 912 Porsche pitted with damage. Edwards held the position for the remaining 20 minutes of the contest to score a fifth place finish. Round 4 of the 2018 IMSA WeatherTech SportsCar Championship, the ACURA SportsCar Challenge, will take the green flag at 1:05 p.m. ET on Sunday, May 6th and be broadcast live on Fox Sports 2 beginning at 1:00 p.m. ET. Follow BMW Team RLL on Twitter at @BMWUSARacing for “from-the-pit-box” updates all weekend. BMW of North America, LLC has been present in the United States since 1975. Rolls-Royce Motor Cars NA, LLC began distributing vehicles in 2003. 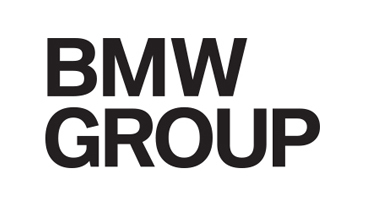 The BMW Group in the United States has grown to include marketing, sales, and financial service organizations for the BMW brand of motor vehicles, including motorcycles, the MINI brand, and the Rolls-Royce brand of Motor Cars; Designworks, a strategic design consultancy based in California; a technology office in Silicon Valley and various other operations throughout the country. BMW Manufacturing Co., LLC in South Carolina is part of BMW Group’s global manufacturing network and is the exclusive manufacturing plant for all X5 and X3 Sports Activity Vehicles and X6 and X4 Sports Activity Coupes. The BMW Group sales organization is represented in the U.S. through networks of 344 BMW passenger car and BMW Sports Activity Vehicle centers, 153 BMW motorcycle retailers, 127 MINI passenger car dealers, and 36 Rolls-Royce Motor Car dealers. BMW (US) Holding Corp., the BMW Group’s sales headquarters for North America, is located in Woodcliff Lake, New Jersey. BMW’s partner, Rahal Letterman Lanigan Racing, based in Hilliard, Ohio and co-owned by three-time IndyCar Champion and 1986 Indianapolis 500 winner Bobby Rahal, former CBS Late Show host David Letterman and Mi-Jack co-owner Mike Lanigan, has been competing for almost three decades. Prior to the start of their 27th season of competition in 2018, the team had compiled 42 victories, 53 poles, 162 podium finishes, three series championships (1992, 2010, 2011) and claimed an Indianapolis 500 victory (Buddy Rice in 2004). In 2009 the team joined BMW of North America to campaign the new BMW M3 in the American Le Mans Series. The following year the team won both the Manufacturer and Team Championships in the GT category and swept all three GT titles – Manufacturer, Team and Driver – in 2011. In 2012, the team finished second in the Team Championship and third in the Manufacturer Championship and in 2013, the team finished second in the Driver, Team and Manufacturer Championship. 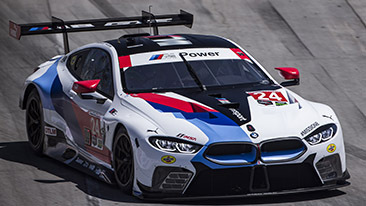 Since 2014, BMW Team RLL has competed in the GTLM class of the IMSA WeatherTech SportsCar Championship with a two car program and has brought their total to 17 wins, 23 poles and 68 podium finishes as well as a second place finish in the Manufacturer, Team and Driver championships in 2015 and 2017. Journalist note: Information about BMW Group and its products in the USA is available to journalists on-line at www.bmwgroupusanews.com and www.press.bmwna.com. BMW Team RLL Hopes for Home Field Advantage at Mid-Ohio; Auberlen to co-drive Turner Motorsport M6 GT3. Le Castellet (FRA) 06th April 2018. BMW Motorsport, FIA WEC Prologue, Alexander Sims (GBR), Augusto Farfus (BRA) and Antonio Felix da Costa (POT), BMW M8 GTE No. 82, Testing. Spectacular weekend for BMW M Motorsport with starts in the FIA WEC, DTM and the IMSA series.